Thanks to 75 energetic volunteers in our Annual Fall Cleanup on Oct. 17th, we removed most of the stain on one-half mile of shoreline. The coves near Stinking Creek entrance to the lake were covered with trash . This same section of shoreline was trash-free after our 2014 Fall Cleanup. The new load came from everywhere upstream being flushed off the land by recent heavy rains on the Haw River watershed . Unfortunately, a lot of the floating trash had to be left behind for another event during a lower lake level. Nonetheless, we are grateful for a few boaters who were scooping it out and to a few others on land who walked into the water. Others combed the shoreline and still others ferried the trash to a dumpster about 2 miles away at the Army Corps of Engineers Headquarters. Many of our volunteers are repeats. 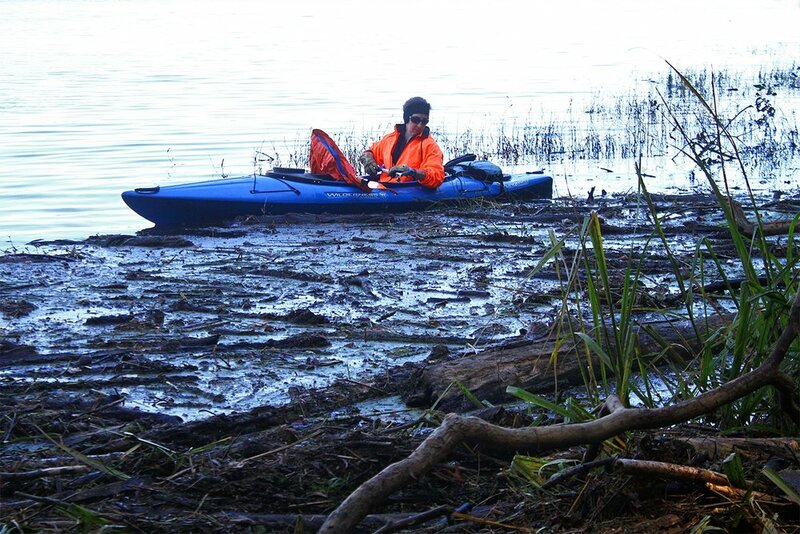 For instance, Doug and his kayak (see photo) have been to NINE of our events! And let's also recognize the continued help of the Army Corps of Engineers (see photo of their trash filled pontoon boat). We're happy to provide an opportunity for youth to volunteer. After all, they're the future stewards of our environment. Stefan Klakovich is a dedicated environmental science teacher in the Chapel Hill-Carrboro School system. He recruited about 20 high school students for our event. Others came from Apex and Pittsboro schools. University students also participated. We had a group from UNC, Dept. of Chemistry's Graduate and Professional Student Federation and another from UNC-Pembroke who were each volunteering during their Fall Breaks. We got TV coverage from Time-Warner News and in the Daily Tar Heel, written by Eric Schwartz who was on the scene talking to our volunteers. 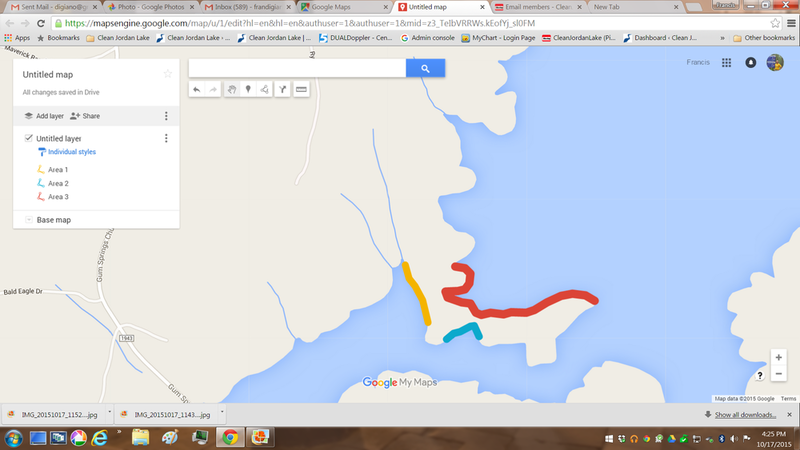 The map shows the cleanup area. 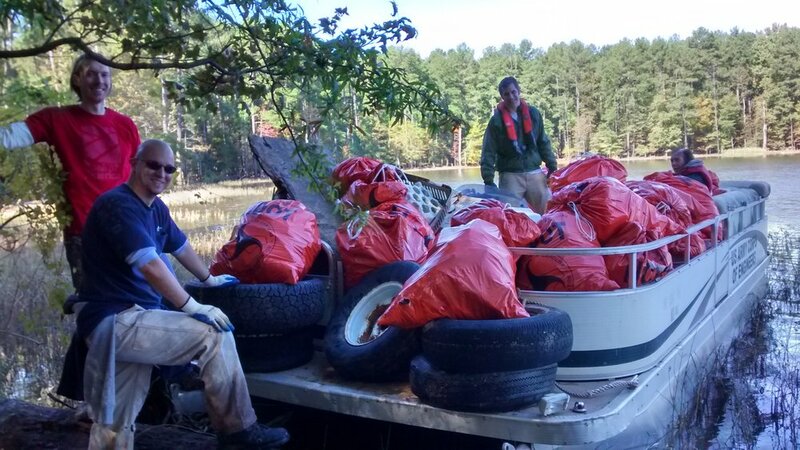 Not counting all the big piece of trash such as pails of construction adhesives, 170 bags of trash and 13 tires were removed. Everyone was treated to a great lunch. All five of our Trash Treasure Hunt items were found and redeemed for nice prizes from Great Outdoor Provision Company, Townsend Bertram and Company, Mountain Khakis and the Pittsboro Roadhouse. Come join us for our Spring Cleanup!